This holiday novella can be enjoyed alone or as book 1.5 of the Hours of the Night Series. Bonfire takes place the December after the events in Vespers. I really enjoyed this second story of the Hours of Night series. Getting to see more Sara and Thaddeus was wonderful. These two are so good together. Plus we get to see how they both handle their first Christmas together. I adored how their relationship grew and evolved in this story. They still have some things to overcome and hurdles to cross. But the hope and potential is more than there. Sara is his same happy self. He consistently pushes Thad’s boundaries to help Thad be happier. Some of the things Sara pushes for are for his own benefit. However he never pushed for things he knows truly matter for Thad or are a part of his core values. Sara never truly wants to push where it’ll harm Thad. He has the best of intentions and seeing where and when he picks and chooses his battles is so fascinating. Thaddeus opens up a little bit more in this story, though most of it is internal. He’s still got a ways to go when it comes to openly expressing his feelings for Sara and being a part of society and life while still protecting his vampiric secret. I do have faith Thad will get there. He emerges from his shell little by little and the parts we see are beautiful. I can’t wait to see him in the next book in the series. His potential as he grows more comfortable being in love with Sara is astounding. The storyline with the lights is short but intriguing. I liked how the whole community worked together to build up the mystery around the lights, but ultimately had little to do with solving it. The actual why and how behind it was over quickly and not as interesting as I had hoped it would be. However the whole thing was well developed and had me wanting to know what happened as I read. These two have a very sweet ending in this story. It’s more than happy for now since they’re together and have proven they can overcome some pretty large obstacles if given the chance. But they’re not at full happily ever after yet. They need to work out those last few things before they can truly have a complete happy ending. You can tell they’re close though and I can’t wait to keep reading their journey. Liv is so kind to stop by today. She shares a bit from Thaddeus’ point of view on romance. His response is wonderful and comes from where you’d expect. However I love how he ties his view into his feelings for Sara. I hope you like it as much as I do. Read and enjoy! Thanks so much for having us back at Molly Lolly! Irene and I are awfully excited to be telling your readers about our newest release, Bonfire. It’s book 1.5 in our Hours of the Night series, not a true sequel to Vespers, but a novella that takes place over the holidays. Because celebrating Christmas with a vampire makes all the sense in the world. And then I decided to let the vampire write the post. As was said in the introduction, I am Thaddeus Dupont, and I have been on this earth for 115 years. Prior to running afoul of a vampire, I was studying at St. Joseph Priory, and had every intention of becoming a monk. I was committed to the rule of St. Benedict both because it required that I dedicate every ounce of my being for the service of others, and because it helped manage my…eh…unnatural impulses. I gave no thought to romance, because romance was not meant for me. For the first ten years of my long undeath, I lived a life of decadence, and during that time I knew physical love. Malheureusement, this affair did not last, and soon I began my extended contract with the White Monks. They agreed to provide for my physical needs, so long as I fought battles on their command and kept my own internal demons in check. Again, romance was meant for others. But what is romance, anyway? A feeling? An emotion? Affection? Love? Maybe some of these, or maybe all. Oddly enough, my first attempt at understanding brought me to the Song of Solomon. While I’d read these words, even mouthed them in prayer, I had no true understanding until I met Sarasija Mishra. He came into my life as the result of a misunderstanding, bringing warmth, and light, and joy. Soon, the words “Behold, thou art fair” conjured his image alone. Now, the word romance is inextricably linked to my young assistant. In my very old age, I’m finding that I have a romantic soul. I want to care for Sara, to protect him. If we are in danger, I would rather send him to safety, even if I’m left alone and desolate. The joy I feel in the simple act of preparing him an omelet and watching him eat is indescribable. The heat of his touch, even a soft brush of his fingertips on my hand, lights up my hour. He has brought me so much, and mon Dieu I would do anything to repay him. Romance is woven through my feelings for Sara, a circumstance that I would have thought was impossible. Yet he is here, daily bringing me back to life. Ah, see? For an old guy, Thaddeus did pretty good. I think he’s right. He does have a romantic soul, a side of him that has more of a chance to shine in Bonfire. If you’re curious about the loose ends we left at the end of Vespers, you’re going to have to wait a bit. Bonfire’s a lighter story, with more of a focus on the guys’ relationship. And a little mystery thrown in! Irene and I will be working on book 2 soon, we promise! If you’ve read Vespers, you know Thaddeus & Sarasija defeated the Big Bad, but Weyer’s Praestigiis Daemonum is still out there somewhere, and depending on who gets ahold of it, all hell could very well break loose. “No.” I rubbed his arm, and he settled under my touch. There was no good response to that. I prayed for an hour, maybe two. I had missed Compline, and it would soon be time for Matins. Sara’s presence had required a number of accommodations, from the colored lights to the interruption of my prayers. Each a small step, insignificant maybe, leading me I knew not where. Here, in this second week of Advent, I should be readying my heart to greet the infant Christ. Instead, I gloried in the warmth of Sara’s body next to mine. The incongruity allowed restlessness to invade my contemplation. Simpler, really, to wonder about the here and now. Why had a man turned up on my front porch? He said he’d followed the lights, but despite the legends, witch lights were a simple phenomenon of the swamp. If not magic, there must be a human agency. Setting aside my rosary, I left the bed, being careful not to disturb Sara. I knelt and said the prayers for Matins under my breath, then changed into some denim pants and a long-sleeved black shirt. I kept a pair of waterproof boots in the kitchen near the back door, so after a last look at my sleeping assistant and a promise to return in time for Lauds, I left the room. The night was cool, and a thin layer of clouds wrapped around the moon. I strode across the damp earth, tuning my ear to the constant buzz of the peepers, the occasional hoot of an owl. My home was on a winding tributary of the Amite River. The deed claimed I owned some ten acres, though much of that was swamp. The land and the water were in a constant dance, splintering and shifting, small peninsulas forming islands when the river rose. Toward the back, though, was an old trail that had once led all the way to the outskirts of French Settlement. Though stretches had been overtaken by the swamp, I headed for that path. I broke into a run, determined to return before Sara discovered I was missing. He would be dismayed, even angry, though I swore I’d share everything I’d found. I picked up my pace, scanning my surroundings for any unusual signs. A flash of light halted my progress. I left the path and skidded in the slick mud to the edge of another tributary, or maybe a pond, half-covered with water lilies. The light hovered between the cypress and tupelo trees, enticing me to follow. I dug my heels in, despite a growing urge to wade out into the algae-ridden water. The sharp racket of an alligator’s warning call broke the compulsion, and I scrambled back to the path. I resolved to ignore the lights, for I was more intrigued by the source of the coercion. I had gone only a short distance when another light flashed, this one closer, and I found myself back at the edge of the water. Merde. Anger spurred my resolve, and I returned to the path, though each step dragged as if the mud itself held me down. I reached the path but was unable to proceed. Something, some invisible barrier, prevented my forward progress. I headed away from the water, but the barrier held while, winking behind me, the witch light beckoned. I persisted for some time, and though I sensed the barrier weakening, it did not give way. Finally, I abandoned my attempt, the fear that Sara would wake up alone outweighing the hold this mystery had on me. I might be in retreat, but I vowed to return and seek out this thing that disturbed our peace. 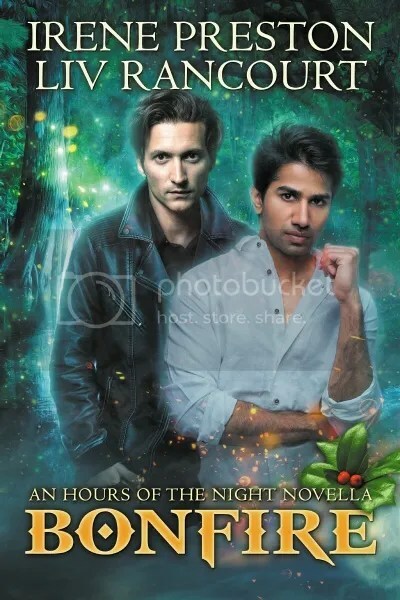 This entry was posted in Guest Post, Reviews and tagged Author: Irene Preston, Author: Liv Rancourt, Contest, Established Couple, Gay, HEA, HFN, Holiday: Winter, Location: Louisiana, M/M, Molly Reviews, Mystery, Paranormal, Rating: 4 stars, Series, Vampire. Bookmark the permalink.